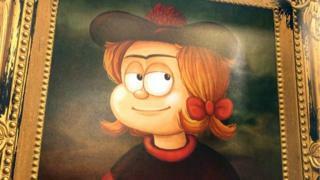 A portrait of Beano character Minnie the Minx in the style of The Mona Lisa has been unveiled in Dundee. The portrait has been made to celebrate Bash Street's Back at the McManus Galleries, renamed McMenace, becoming the most popular comic exhibition ever in the UK. The gallery is a tribute to the Beano's 80th anniversary and has seen more than 80,000 visitors. Minnie Lisa by "Duh Vinci" will be in the exhibition for its final weeks. The portrait shows Minnie with a mysterious enigmatic grin, wearing a trademark red and black jumper. Visitors are being encouraged to share a selfie with 'Minnie Lisa' for the chance to be immortalised as a Beano character. With the addition of the portrait, it is hoped visitor numbers will reach 100,000 by the end of the exhibition, on 21 October. Mike Stirling, head of Beano Studios, said: "I was optimistic we'd get a decent crowd in, probably a better crowd than United and Dundee this season, but what has actually happened has been incredible. So far that it's the most successful exhibition ever in McManus, the most successful exhibition ever Dundee and the most successful comics exhibition in the UK ever. "We have already whizzed past the 80,000 visitor mark, now before 21 October we are dreaming of making the ton. "To do that, not only have we uncovered this wonderful piece of art but we are further incentivising things by saying that, if you take a selfie alongside the Minnie Lisa and hashtag 'McMenace' on your social media, one of the people is going to be immortalised as a Beano character." The current visitor figures beat the previous highest total for a comic exhibition in the UK, 54,324 for Comics Unmasked at the British Library in 2014. Visitor numbers also exceeded other exhibitions held at the McManus such as Ten Drawings by Leonardo da Vinci and Titian's Diana. Carly Cooper, curator of social history at McManus said: "We hope the people who have come in to see the museum will come in again to see this new piece that has been unveiled. "We have been absolutely amazed with the exhibition, it has been fantastic, it has been the biggest visitor figures in a while, probably more than we expected, it has been our summer blockbuster. "To everyone who hasn't been, we encourage you to come in before it is all taken down."